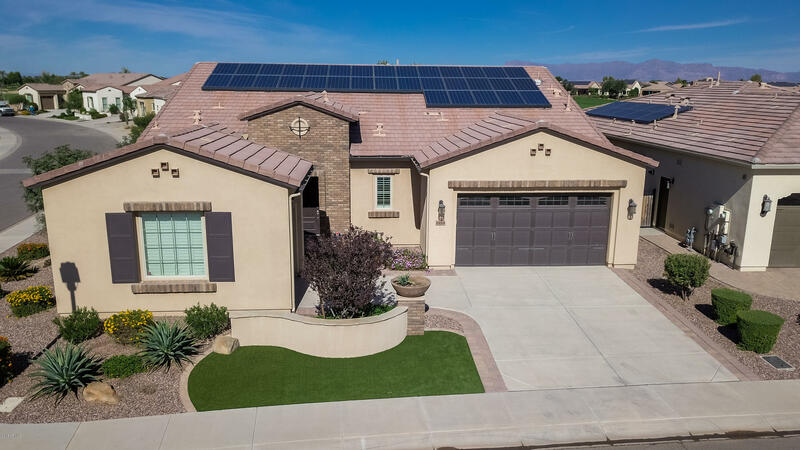 Absolutely beautiful Cartagena model w/a Full Shea Xero Solar System, 3 BRs, 3 baths & 3 car garages. This home is uniquely situated w/golf course & mountain views. The Gourmet kitchen is upgraded w/white cabinetry, SS appliances w/wine fridge & granite countertops. Beautiful wood grained ceramic floors throughout main living area w/carpet in the bedrooms. Offering 2 guest bedrooms & a full 3rd guest bath. Many high end features including upgraded moldings, rolling wall of glass, French doors leading from both the M BR & morning room to the large covered patio with golf & mountain views & a gas fireplace. Enjoy the Encanterra Resort Lifestyle - Private Championship Golf Course, 60,000 sf Clubhouse, Dining, Tennis, Pickle Ball, Member Clubs, Activities, Pools, Athletic Club, Spa & more!